Screen Yorkshire has released more details about the new feature length documentary about Bradford-born artist, David Hockney. Described as the “definitive” exploration of one of the most important artists of his generation, the film is being made by Randall Wright. “It's been said that there was something of the holiday about David Hockney, that, despite personal loss, he sees the world with holiday eyes, as if for the first time. I wanted to capture this attitude without taking away the mystery and magic of a great artist,” explained Wright, who met Hockney while filming a BBC Omnibus programme. An important contributor to the Pop art movement of the 60s, Hockney is considered one of the most influential British artists of the 20th century. However, this is the first time that he’s opened up his personal archive of photographs and films, essentially a “visual diary” of his life. The 105-minute film is to be released through Picturehouse Entertainment on 28th November 2014. 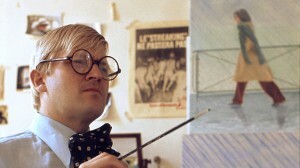 A preview at selected cinemas will be followed by a satellite Q&A with Hockney live from his LA studio. Next year it will be broadcast on BBC Two. The producer is Kate Ogborn from Fly Film. It was commissioned by Kim Shillinglaw, controller, BBC Two and Mark Bell, head of arts commissioning. It’s being made by Blakeway Productions and Fly Film Company and is co-funded by BBC Arts and the British Film Institute in association with Screen Yorkshire through its Yorkshire Content Fund, British Film Company and the Smithsonian Channel.